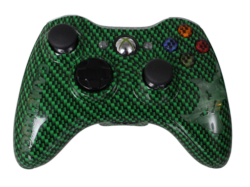 Exclusive partnership lets party-goers “test drive” the world’s #1 modified Xbox 360 controller. By partnering with GameTruck, gamers will be able to tryout our products in the ultimate environment for an unbeatable gaming experience. Evil Controllers and GameTruck, two companies recognized for their product innovation and creativity, are teaming-up to outfit GameTruck’s mobile video gaming theaters with custom modded Xbox 360 controllers not sold anywhere else. The exclusive partnership, launching this March, will provide GameTruck party-goers with the unique experience of “test-driving” Evil Controllers’ after-market modded controllers during birthday parties, corporate and educational events. “Until now, the only way to experience the thrill and excitement of playing with an Evil Controller was to borrow one from a friend or purchase one online through our company,” says Evil Controllers Founder and Lead Designer Adam Coe. “By partnering with GameTruck, gamers will be able to tryout our products in the ultimate environment for an unbeatable gaming experience.” Coe started the company at age 19, launching the first-ever after-market modified controller company in the world. GameTruck, the original mobile video game company, has more than 70 mobile video game trucks in most major markets across the country. The bus-size, self-powered trucks are fully loaded with giant HD plasma screens, gaming consoles to accommodate 16 or more players at one time and over 50 multiplayer games for customers to choose from. GameTruck’s Official Evil Controllers Party™, will include at least one “MVP Player” controller, outfitted with all of the aesthetic and performance enhancements available, including glow-in-the-dark LED lights, rapidfire and all of the master modifications available. Additional controllers will have aesthetic upgrades, plus Evil’s pro gaming thumbsticks and their Evil D-Pad, voted the 2nd best piece of gaming hardware for the year 2010 by Inc Magazine. “Our goal at GameTruck is to provide a memorable event experience for gamers of all ages,” says David Wachtel, chief operating officer of GameTruck. “Evil Controllers is an awesome addition to that experience – it’s an exclusive distinction that will ensure our gaming experience continues to be the most superior in our industry.” GameTrucks in major markets, including Chicago, Los Angeles, Phoenix and Portland will be ready to host an Official Evil Controllers Party starting this March.